Lee Gates (George Clooney) is the host of a tacky financial advice show, but when the stock tanks on a company that he encouraged his viewers to invest in, he is taken hostage live on air by Kyle Budwell (Jack O’Connell), a young man who has been hurt by the bad investment. Wielding a gun and forcing Lee to wear a bomb vest with a dead man’s switch that will go off if his thumb comes off the trigger, Kyle is looking for answers, leaving the show’s director Patty Fenn (Julia Roberts) desperately trying to deescalate the tense situation from inside the booth, while unravelling a financial conspiracy involving a sleazy CEO (Dominic West). Directed by Jodie Foster, Money Monster is a slick and fast-paced thriller, bolstered by a timely sense of anger towards the rigged financial system. George Clooney is in fine form as a smooth talking negotiator who is trying to weasel his way out of a tough situation, and Jack O’Connell makes us feel sympathetic towards his character, despite his unfavourable actions. Although there are a few plot holes, especially during the somewhat frantic climax, this is a mostly smart and engaging piece of adult entertainment, that sustains enough suspense throughout to keep us watching. The DVD also includes deleted scenes, a couple of featurettes, a scene analysis and a music video. 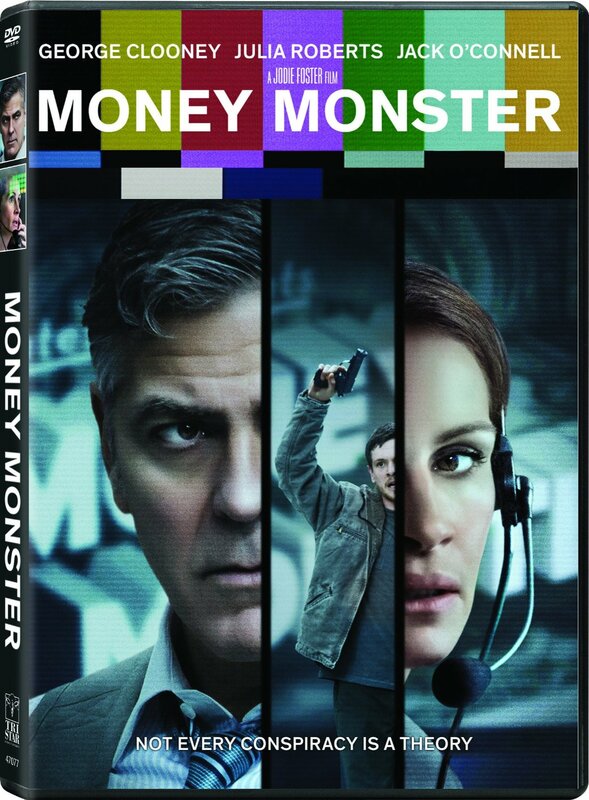 Money Monster is a Sony Pictures Home Entertainment release. It’s 99 minutes and rated 14A.